WTA tennis champion Agnieszka Radwańska helped make dreams come true for a tennis-mad couple when she officiated their wedding on centre court at Auckland’s ASB Tennis Arena on New Year’s Eve. 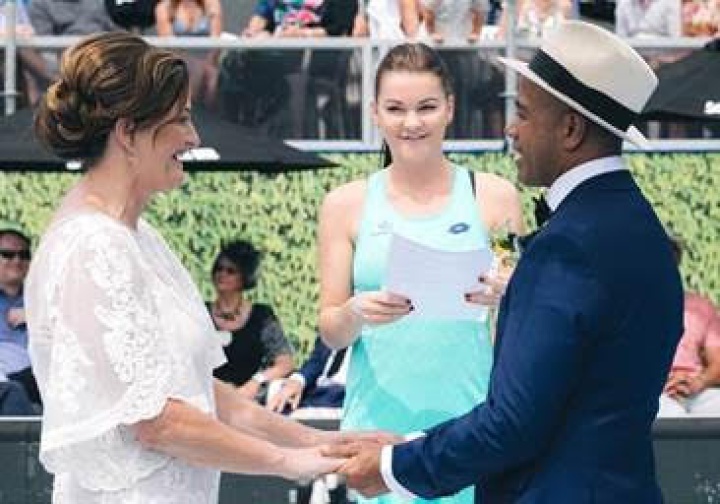 The tennis-themed nuptials were organised by ASB as part of the game, set, matrimony event on the eve of the 2018 ASB Classic. More than 120 of Feleti Sofele and Janine Thirlwall’s friends and family joined the pair to celebrate their big day, and were surprised when the ASB Classic’s women’s tournament’s fourth seed Agnieszka Radwańska arrived on court to help officiate the ceremony. After the ceremony the newlyweds were buzzing, with Feleti saying he was amazed when Radwańska walked over to meet them at the altar. “We were told we might get a few photos with a player, so it was pretty cool when Radwańska came out to actually be part of the ceremony,” Feleti said. Later in the afternoon as Mr and Mrs Sofele were having their wedding photos taken Radwańska returned to the court – this time to practise. While warming up she asked the pair whether they’d like to have a few hits with her on court. Feleti and Janine jumped at the offer to have a hit with the tennis star, still in their wedding attire. The couple then joined friends and family for a reception at the ASB Tennis Arena. ASB head of community, sponsorship and events Mark Graham was pleased Feleti and Janine loved their special tennis-themed day as much as ASB enjoyed organising it for them. “Feleti and Janine are arguably New Zealand’s biggest tennis-loving couple; they met at a tennis club and got engaged on a tennis court so it was fitting for their wedding to take place at New Zealand’s home of tennis with one of this year’s biggest ASB Classic names,” Mr Graham says. Feleti and Janine Sofele will return to Stanley Street on Saturday to perform the coin toss for the ASB Classic women’s final. Click here to watch the wedding video.